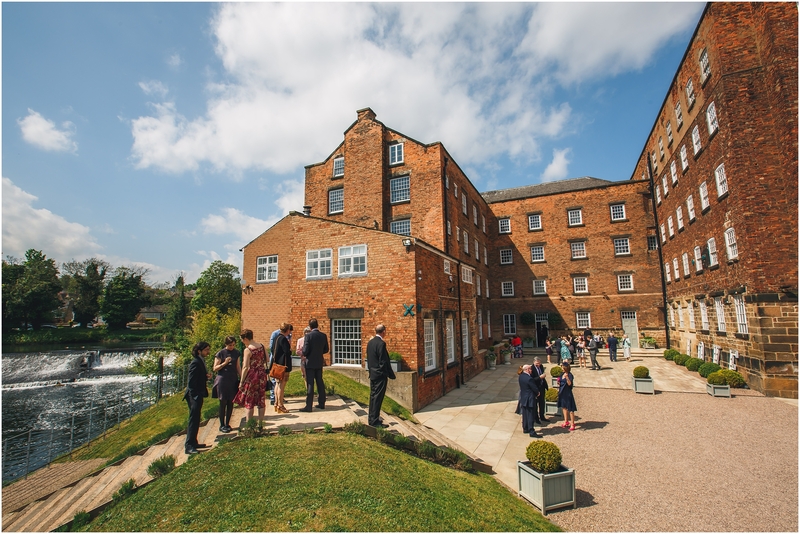 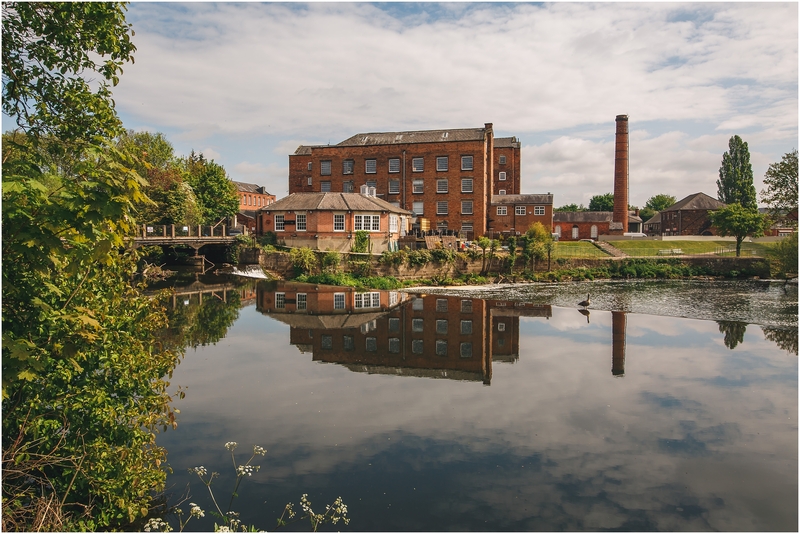 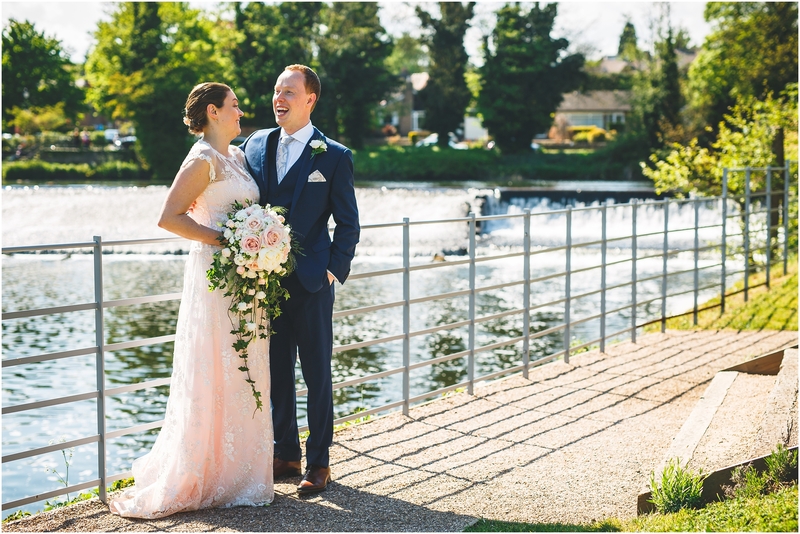 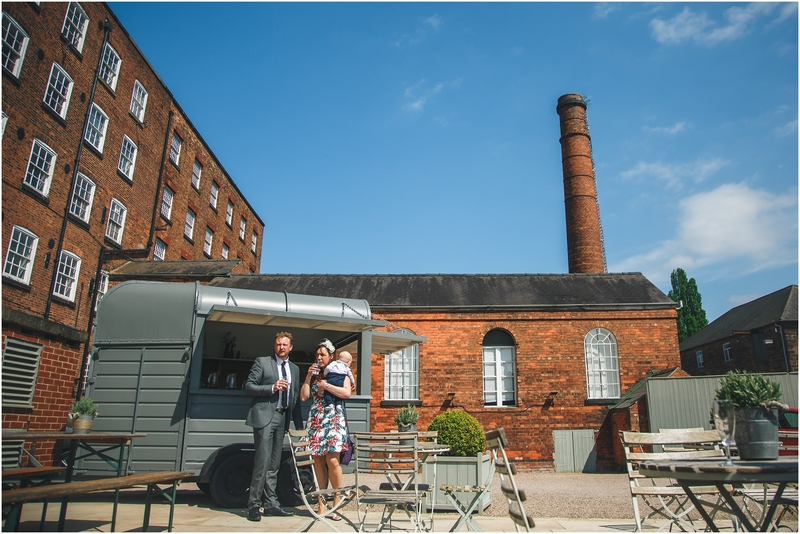 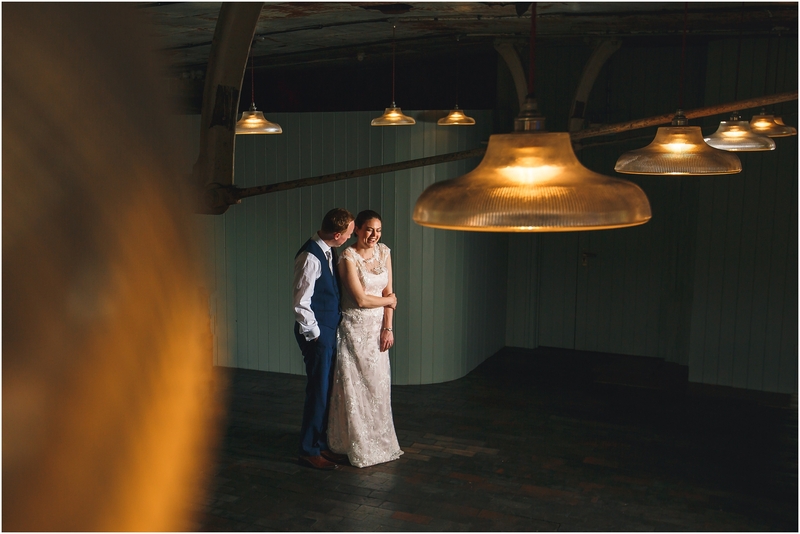 What a day we had with Adam & Claire for their wedding photography at the West Mill! 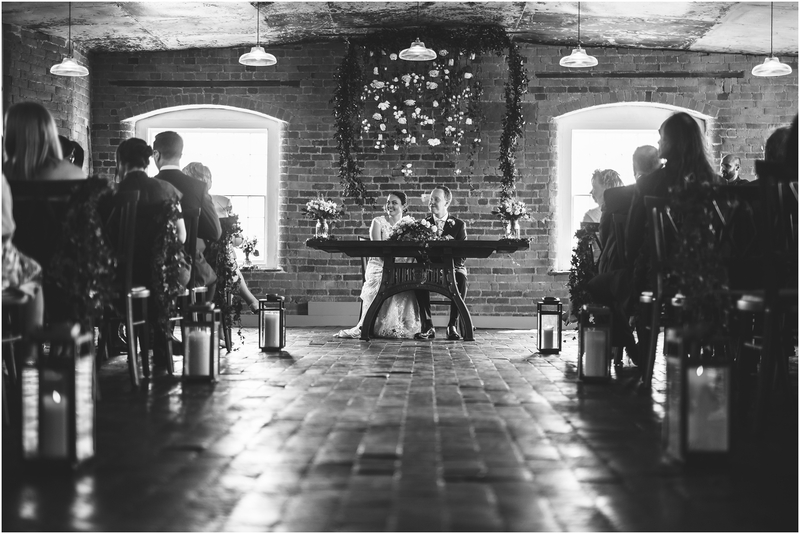 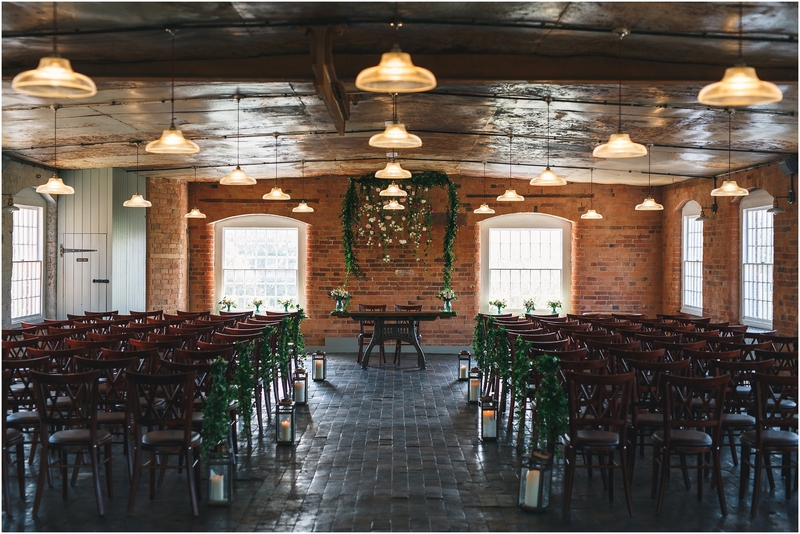 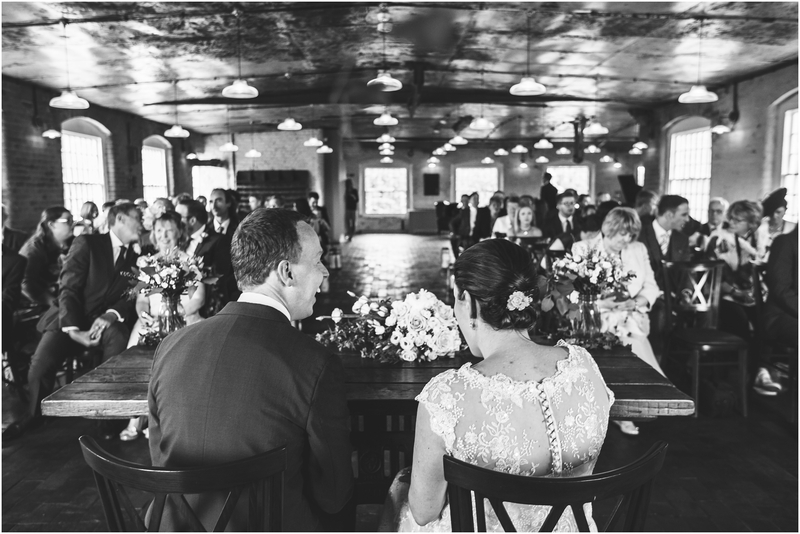 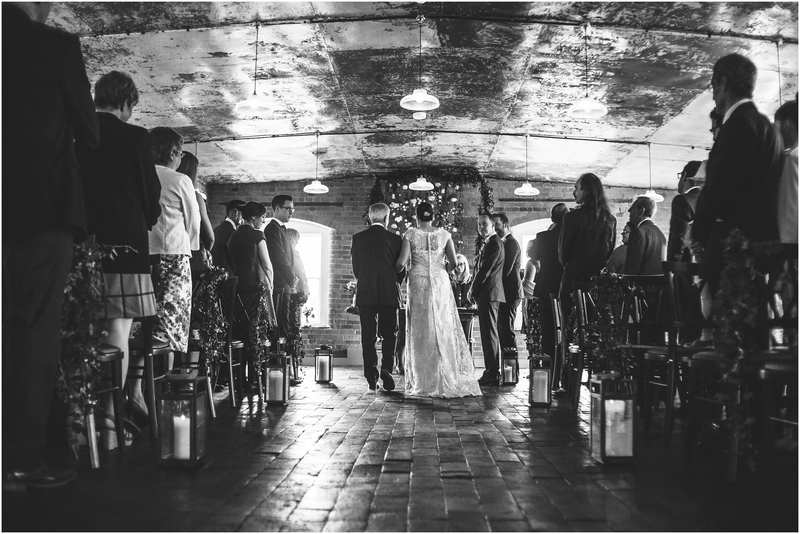 This grade 1 listed building oozes rustic elegance and charm which fit Claire & Adam perfectly. 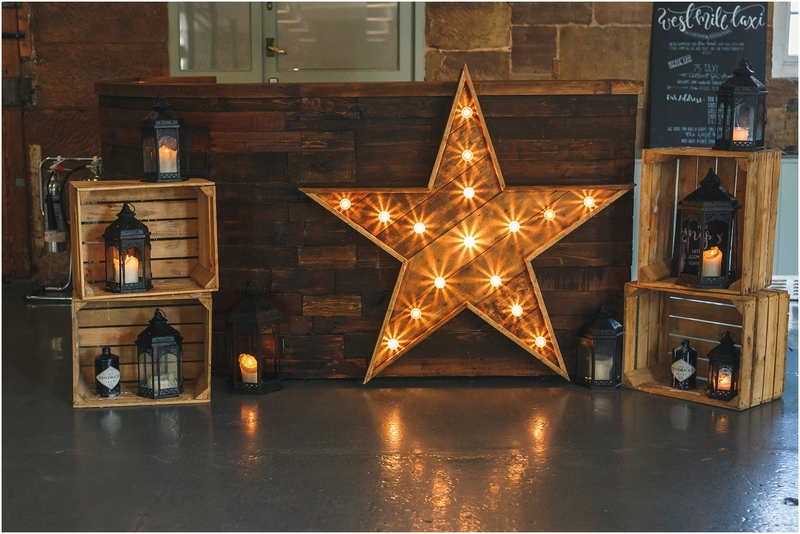 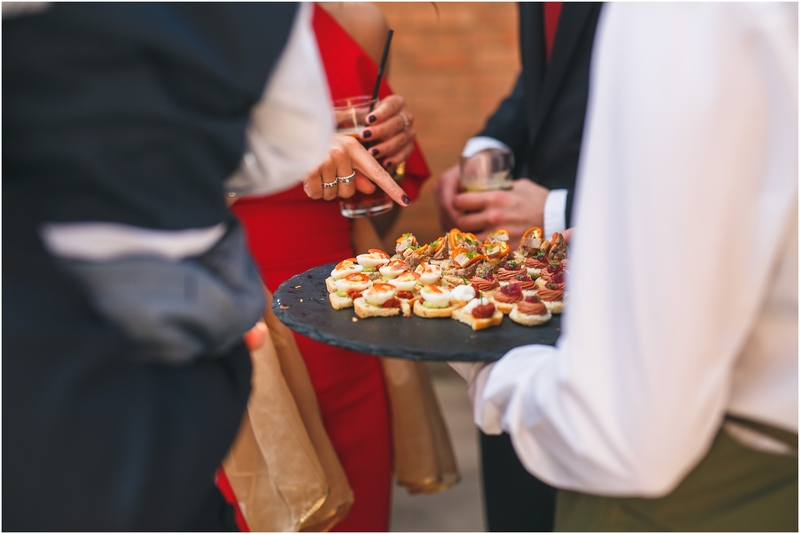 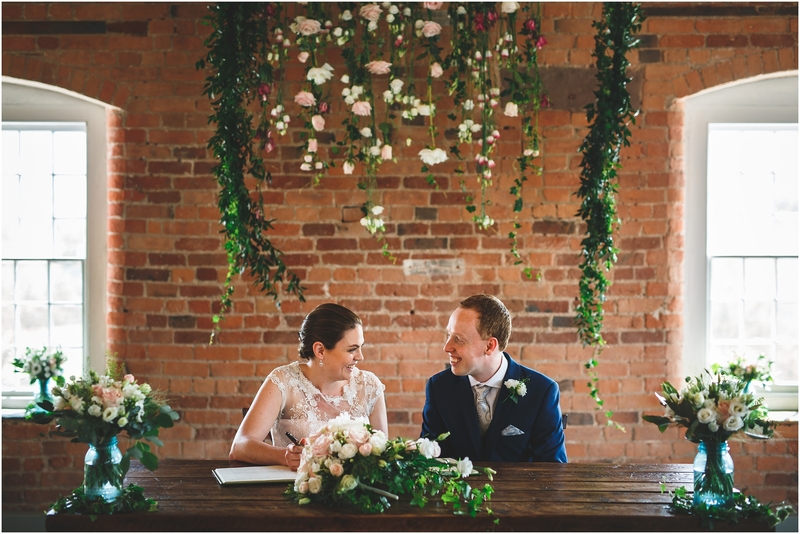 Their wedding was full of small, simple touches which complemented the lovingly renovated exclusive-use venue perfectly. 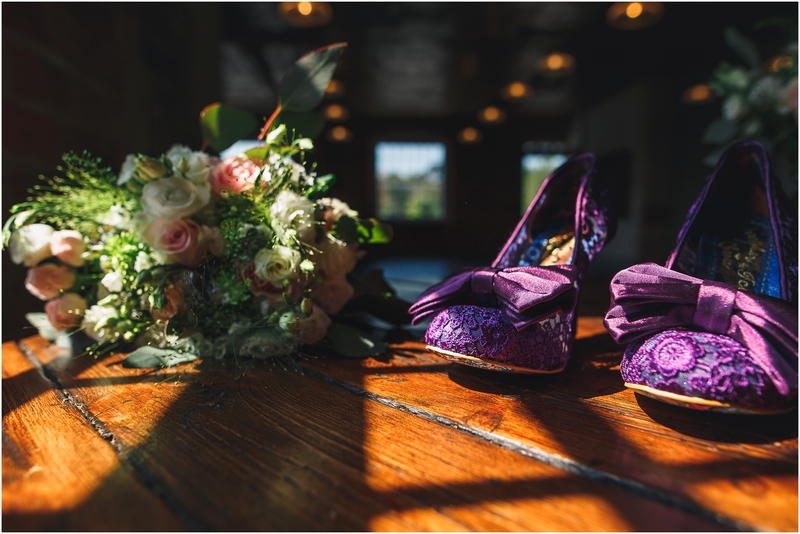 The bridesmaids were dressed in plum-coloured dresses which matched Claire’s amazing shoes from Irregular Choice and really showed off the bouquet colours in their finest. 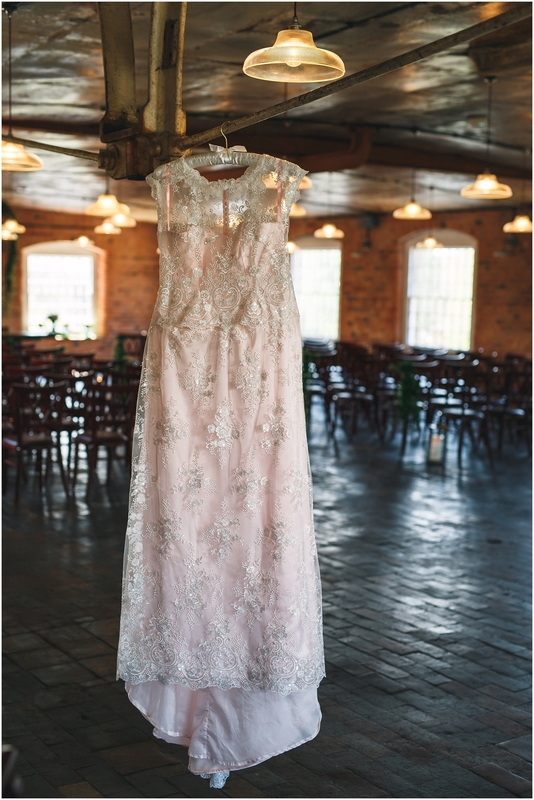 Claire’s dress deserves a blog post all of its own. 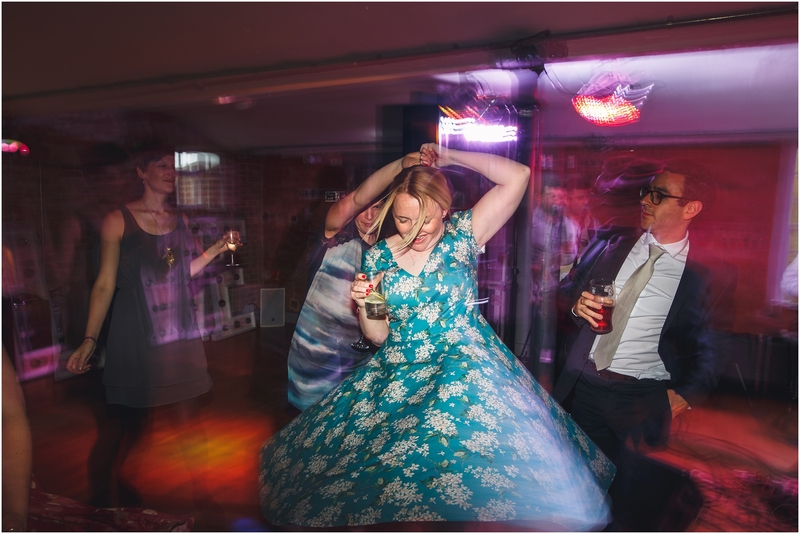 The dress even got its own photoshoot in the Cotton Quarter before Claire was even in it! 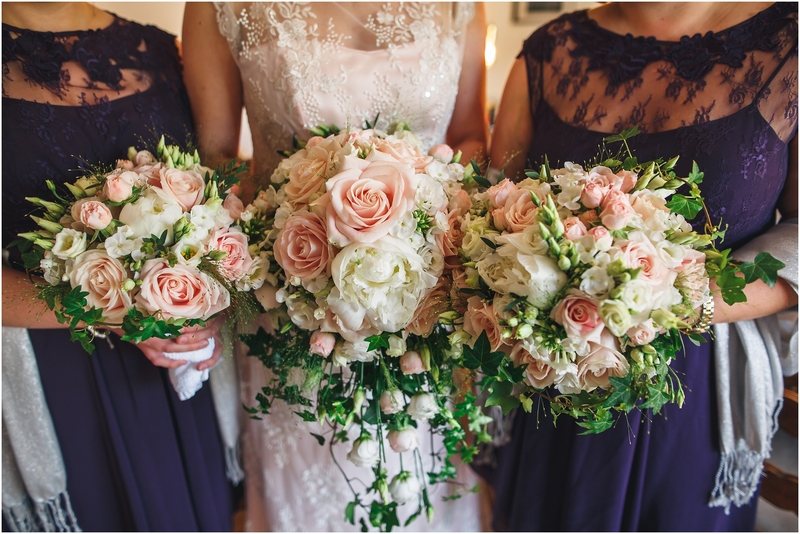 Lovingly made by the bride herself, yes really – I can only begin to imagine the extra organisation and (dare I say it) stress that must have added to the wedding planning process! 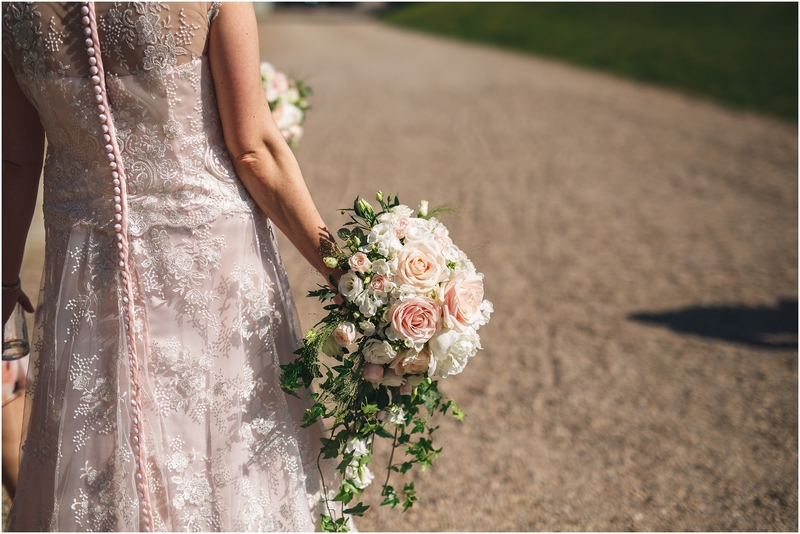 A keen seamstress, Claire designed, drafted and lovingly made this timelessly elegant rosewater silk satin dress over five months and she freely admits this was definitely her biggest undertaking to date! 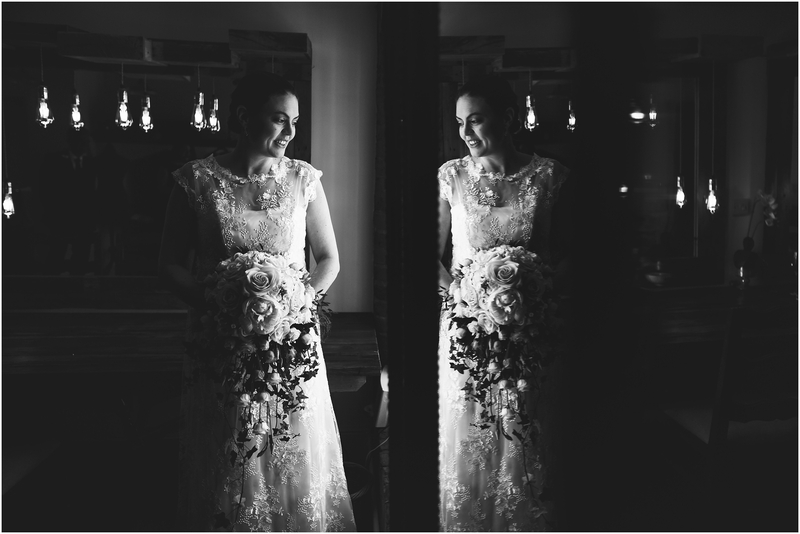 The dress has an ivory illusion lace overlay bodice with cap sleeves. 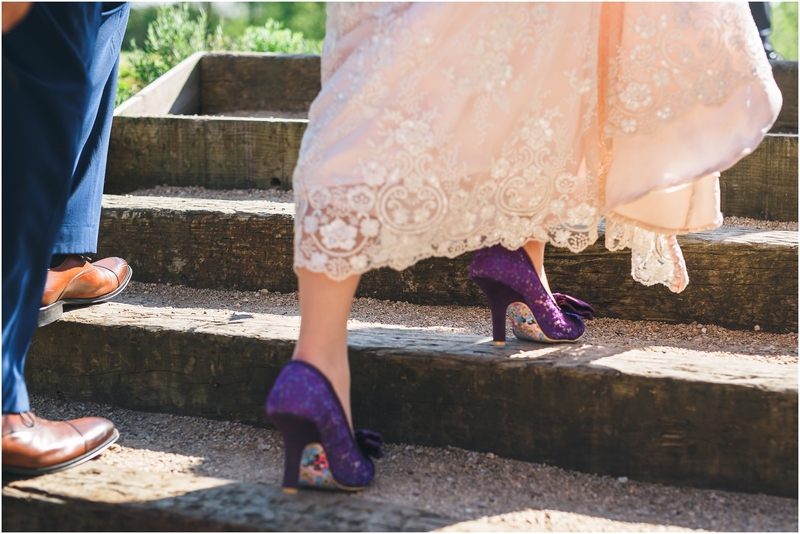 The skirt is a gentle A line finishing in a curved train and there is a surprise at the back where it is finished with rosewater buttons (all 126!) 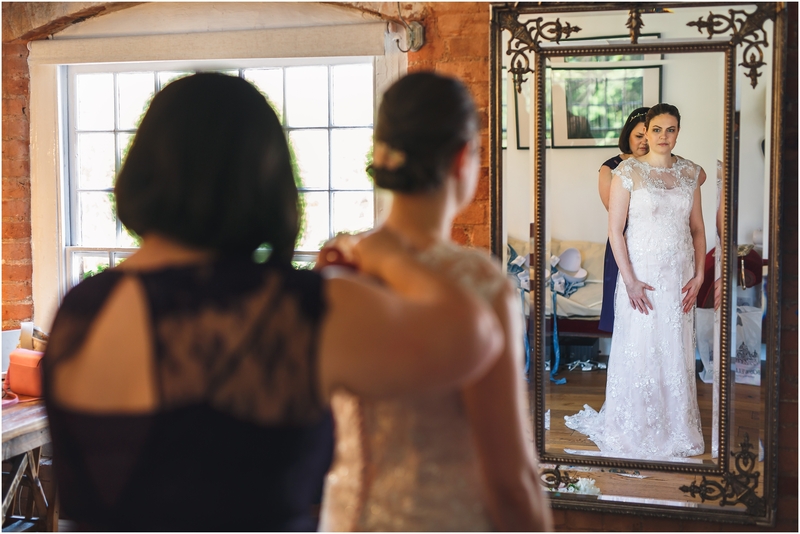 the full length of the dress. 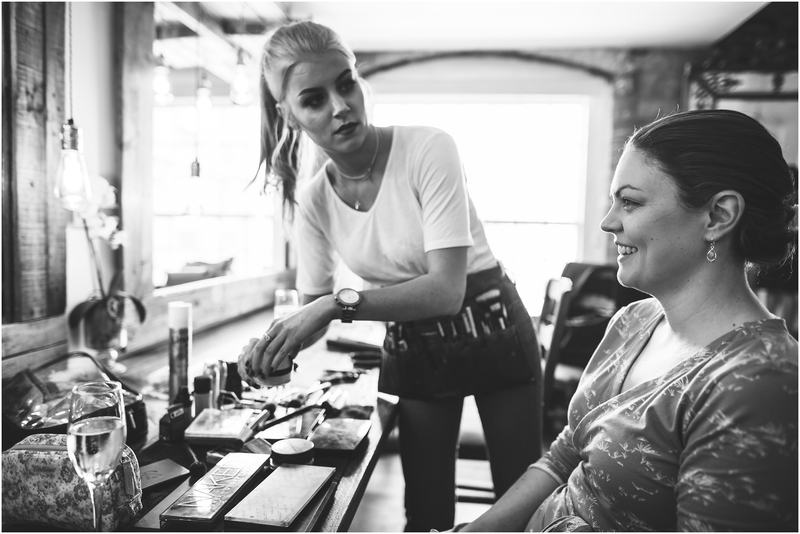 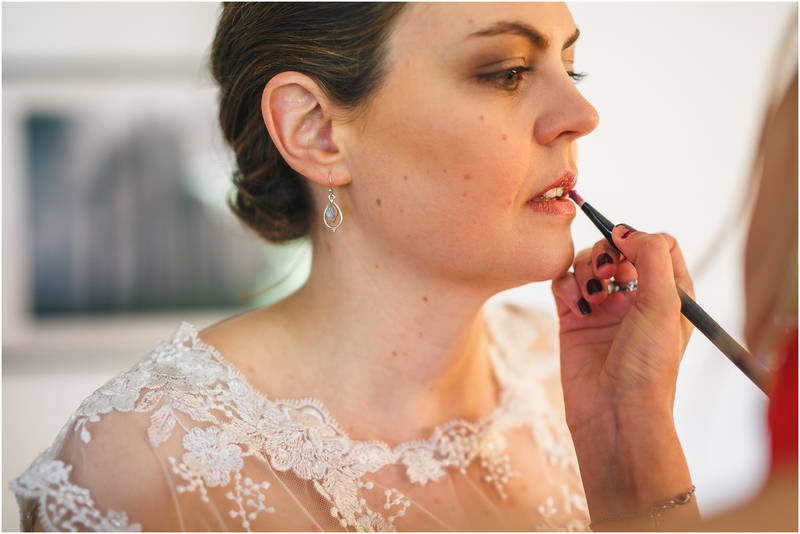 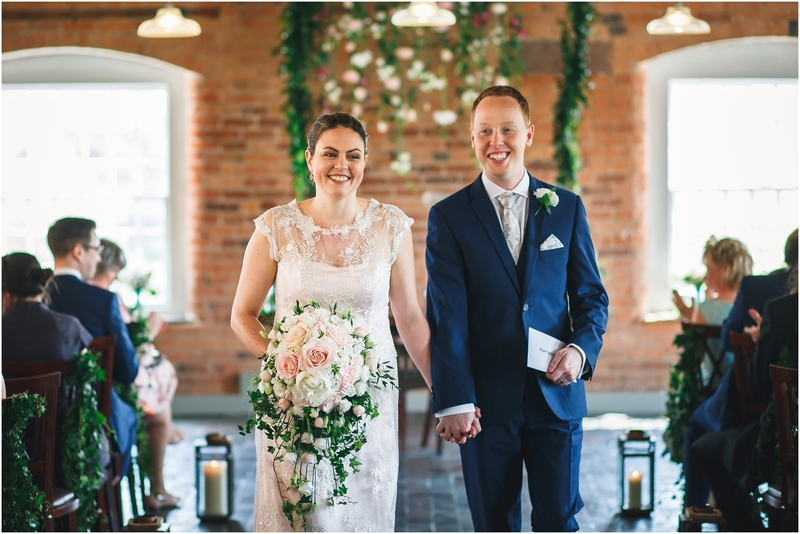 Click here to read Claire’s blog about the whole process and advice to any brides wanting to undertake the challenge of making their own wedding dress! 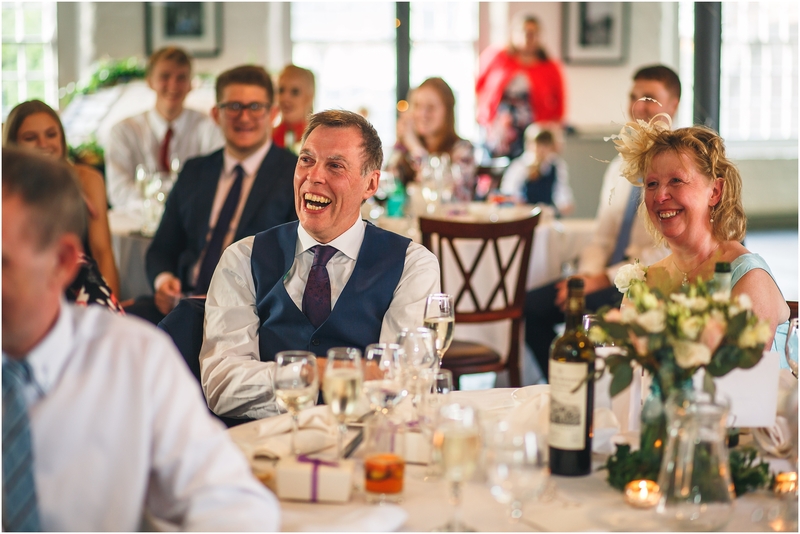 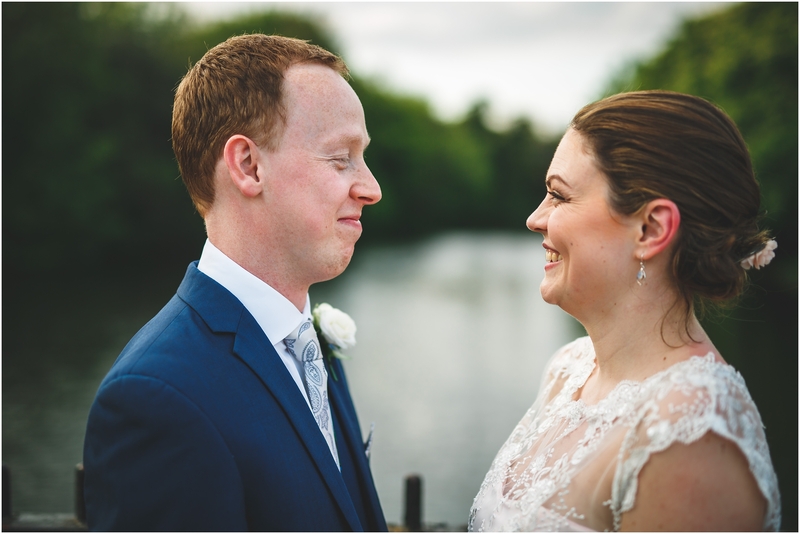 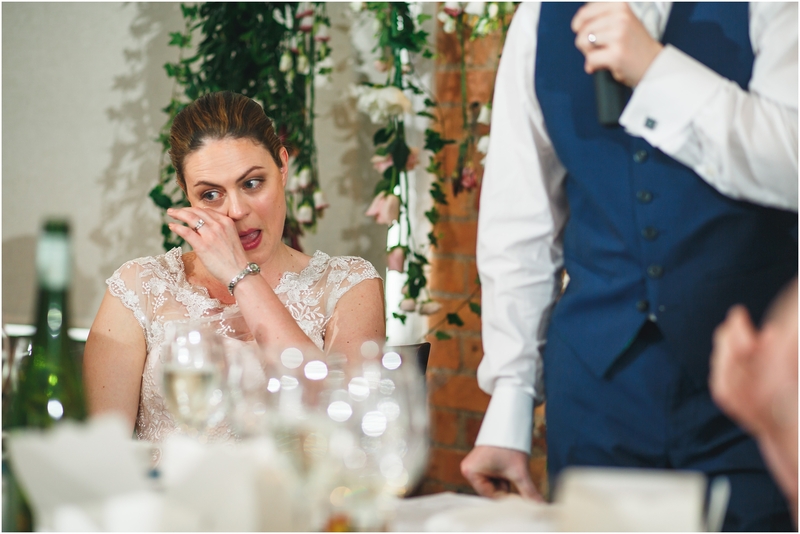 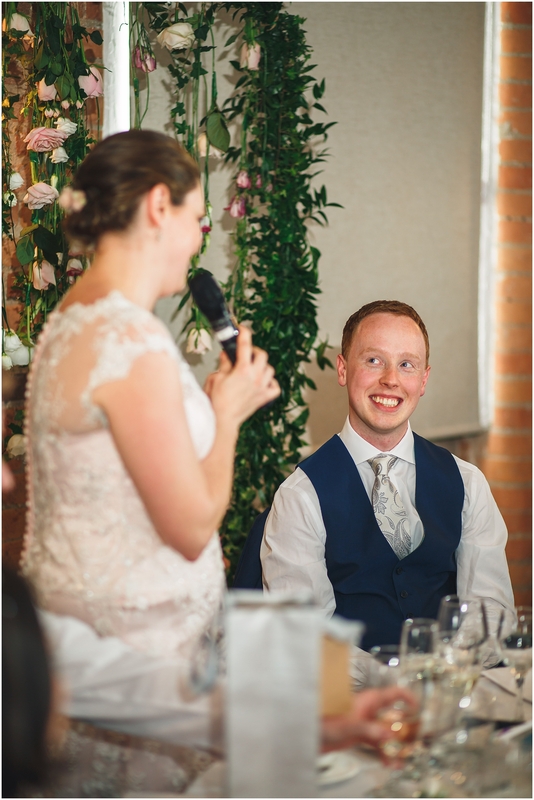 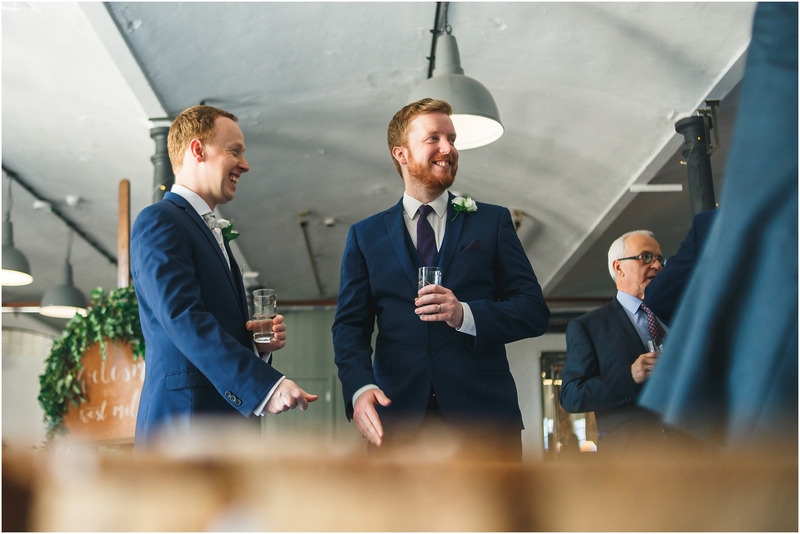 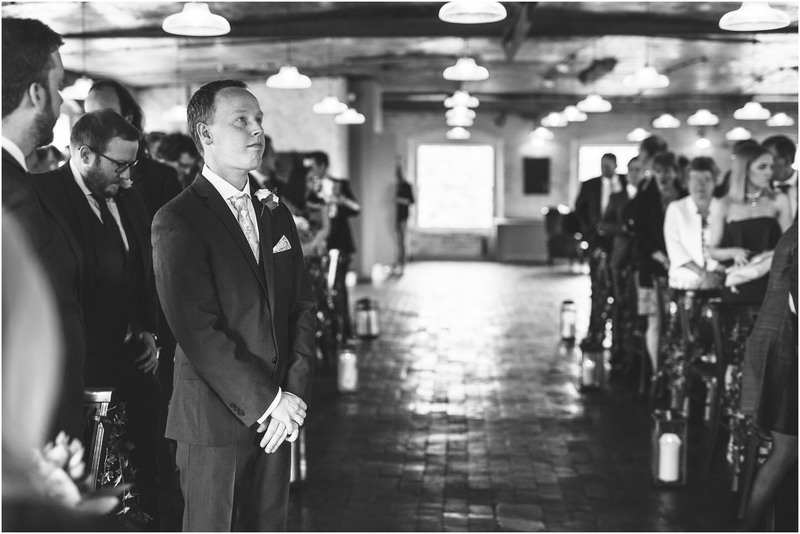 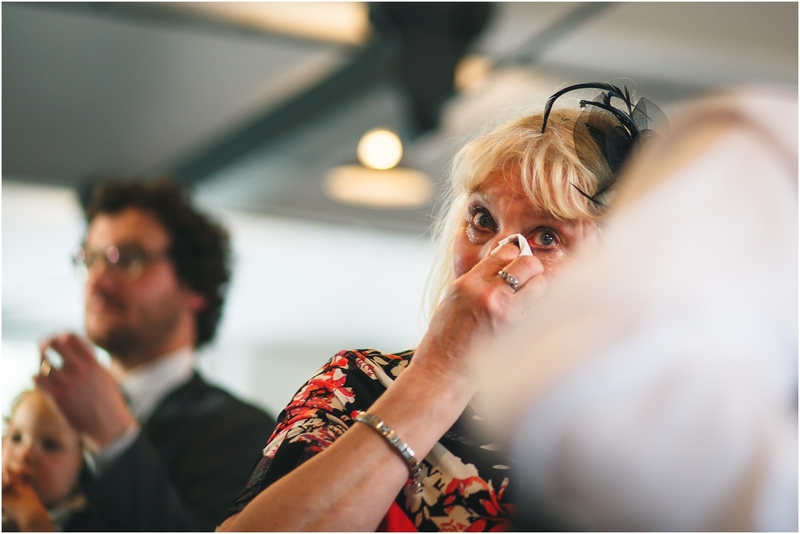 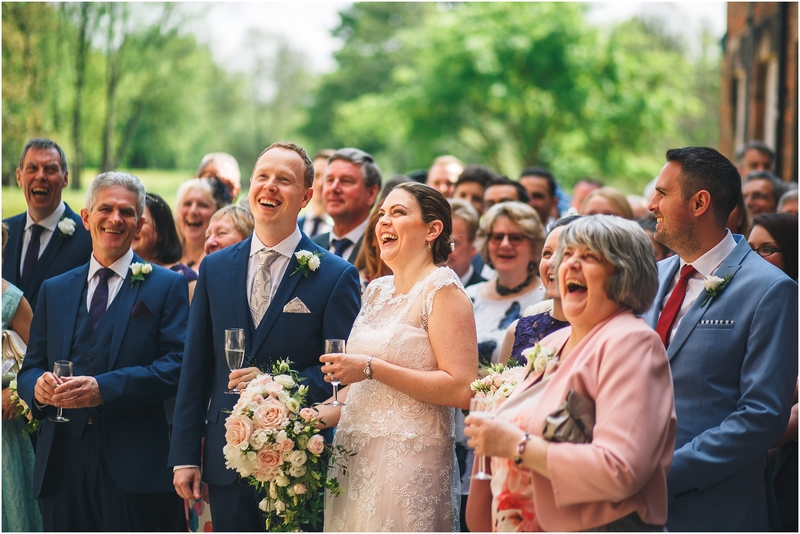 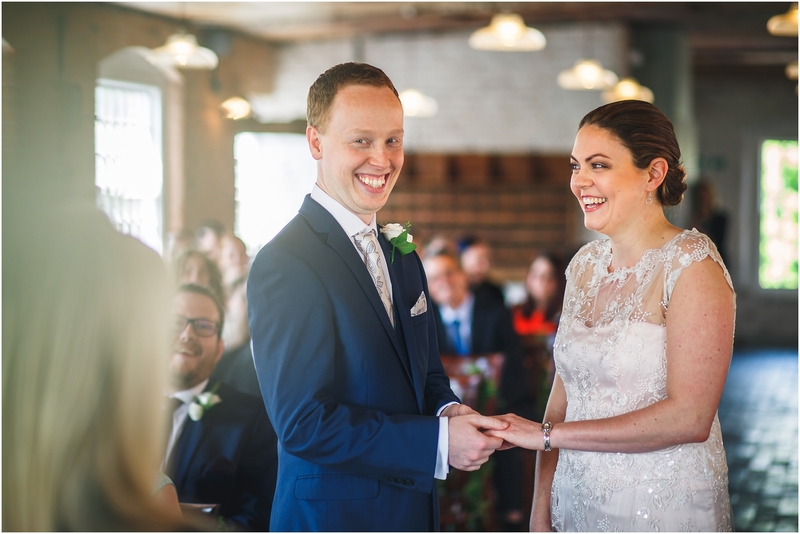 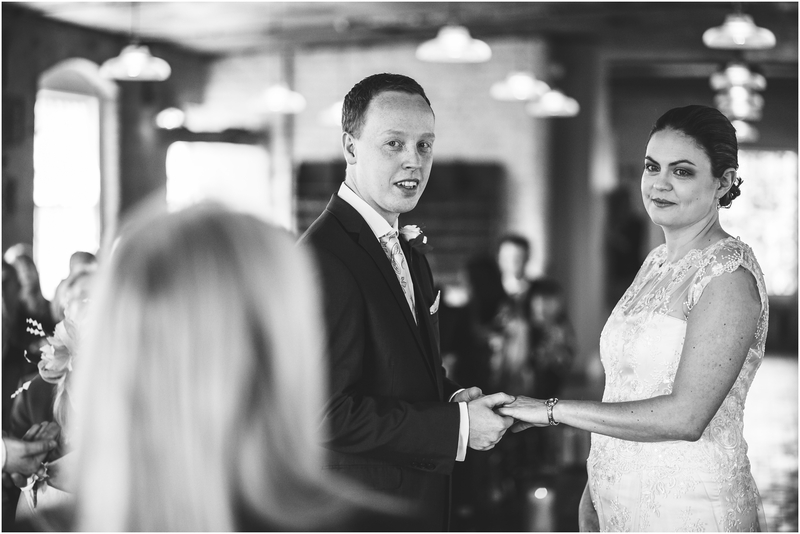 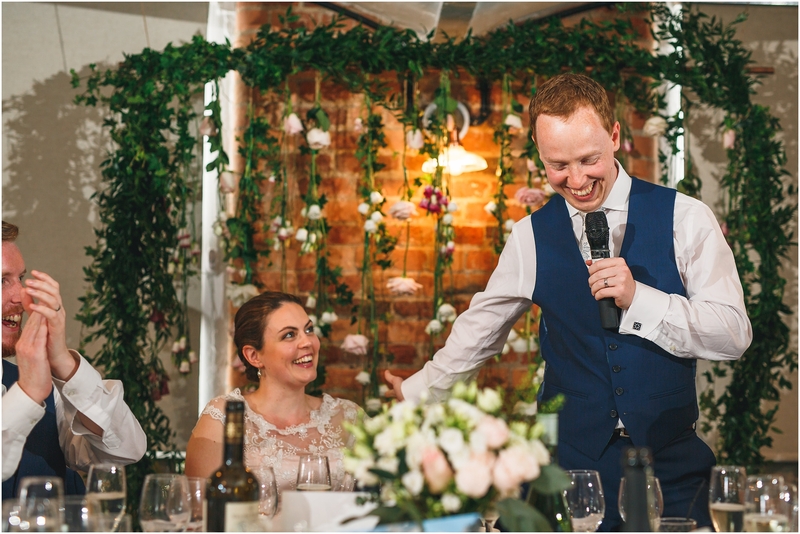 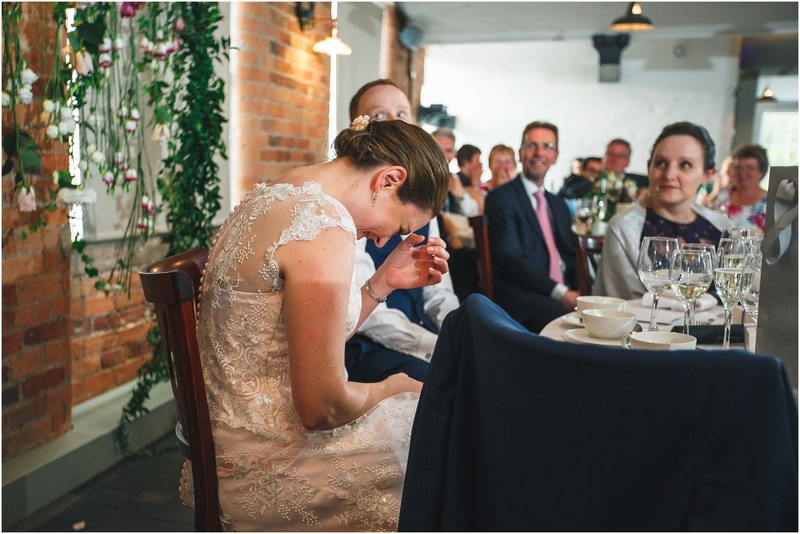 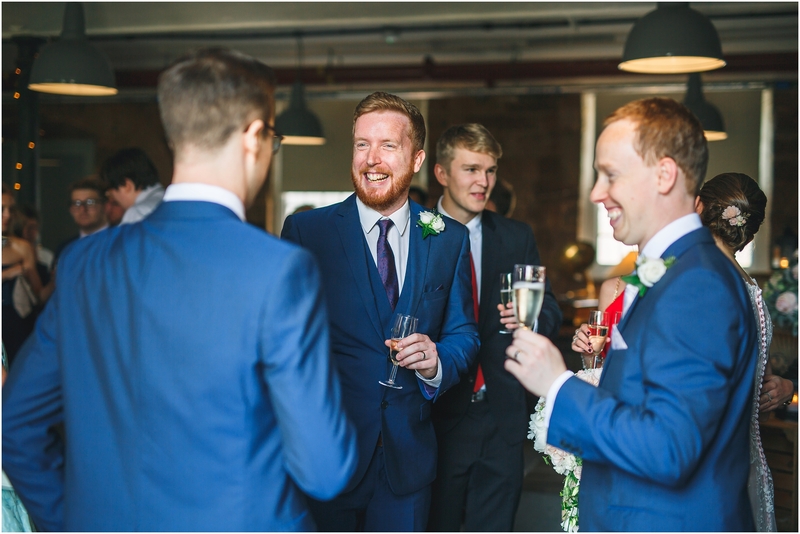 Adam’s face when he first saw Claire walking down the aisle was full of emotion – I really do love that bit of the ceremony! 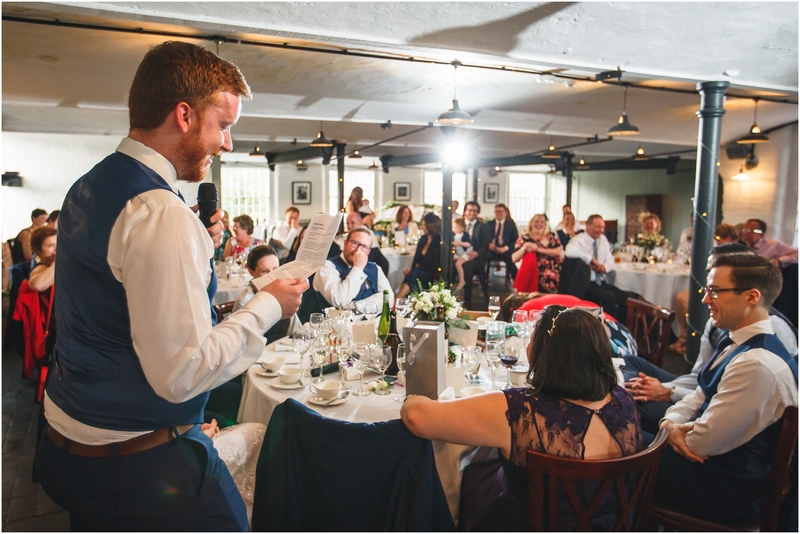 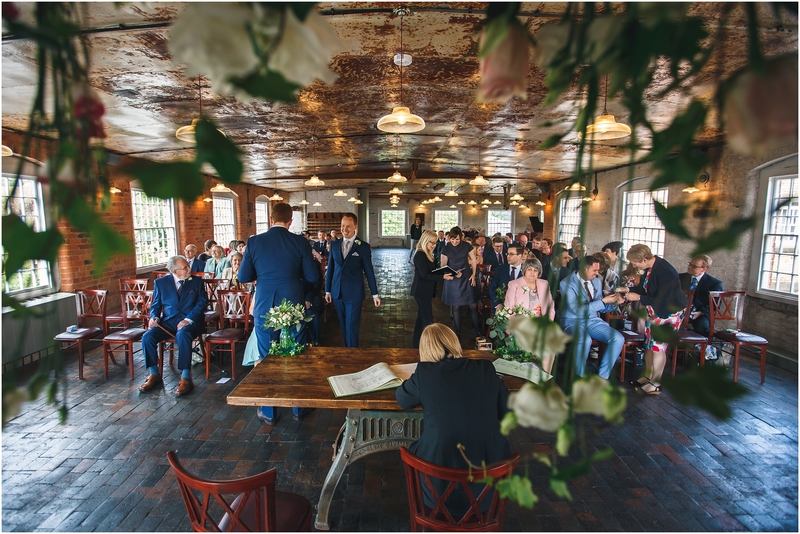 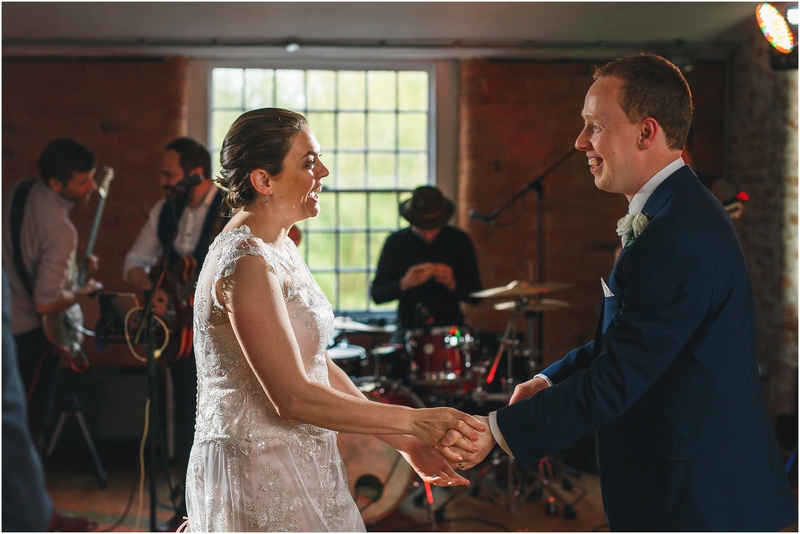 With loved ones performing readings the ceremony was beautiful throughout and the sun was gleaming in through the many windows by the time Claire and Adam had said “I do” and were signing the register – perfect for their guests to spill out into the courtyard for their drinks reception. 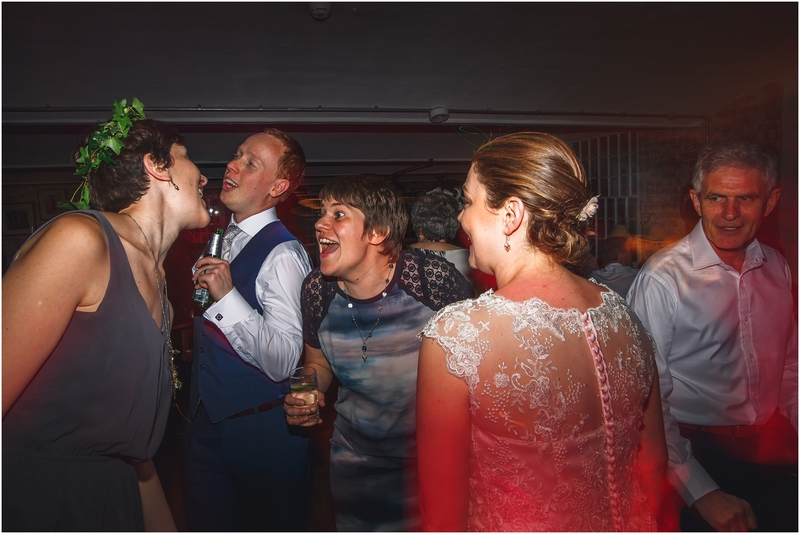 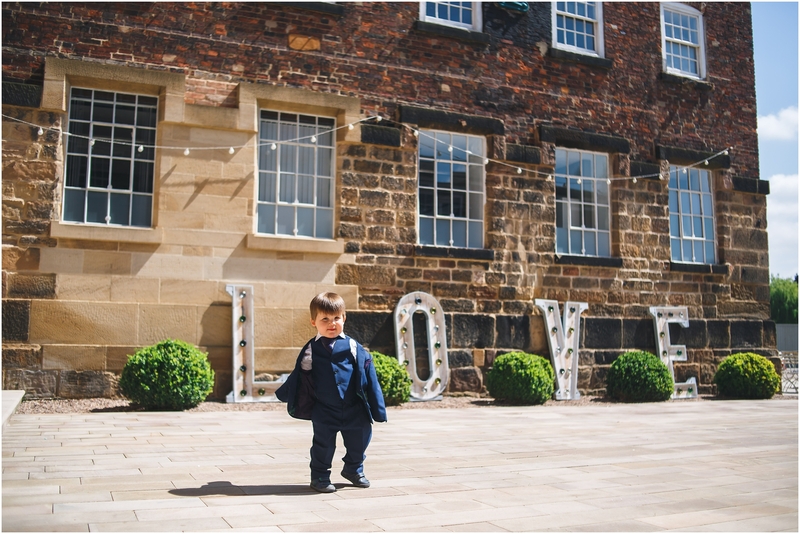 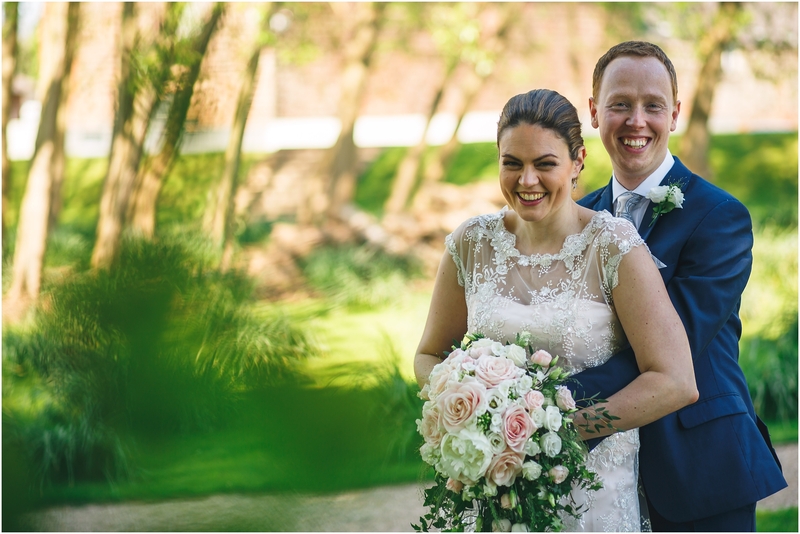 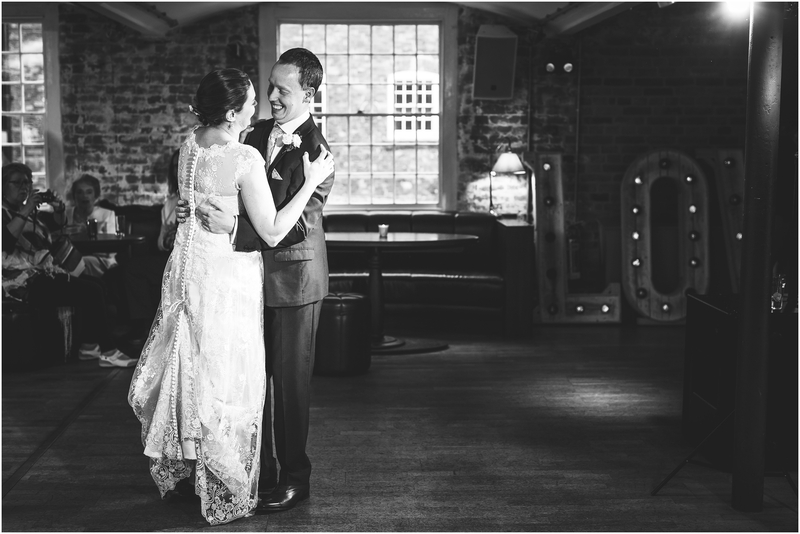 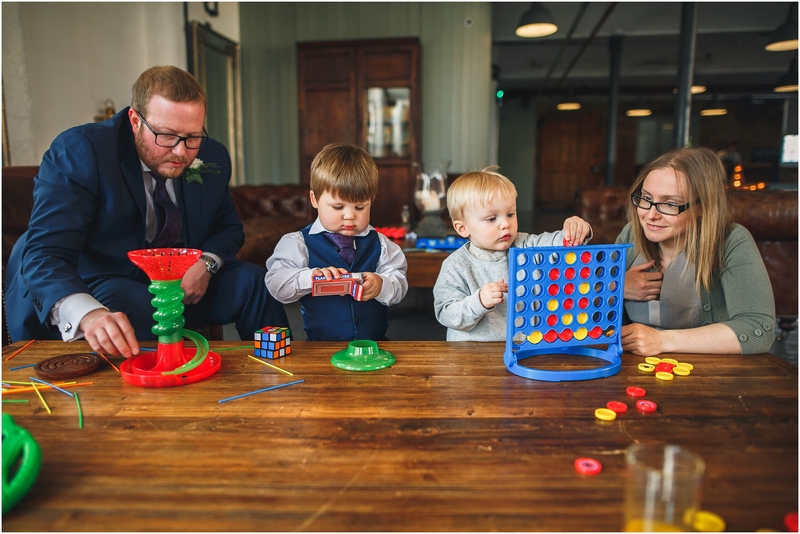 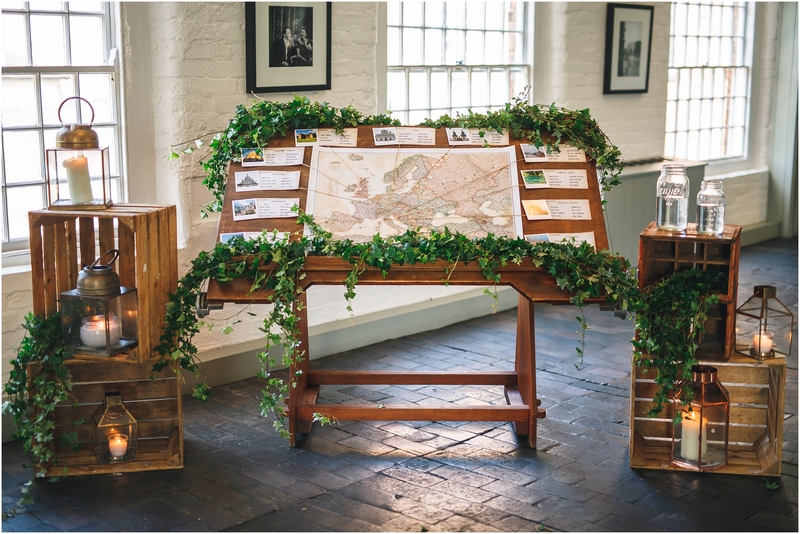 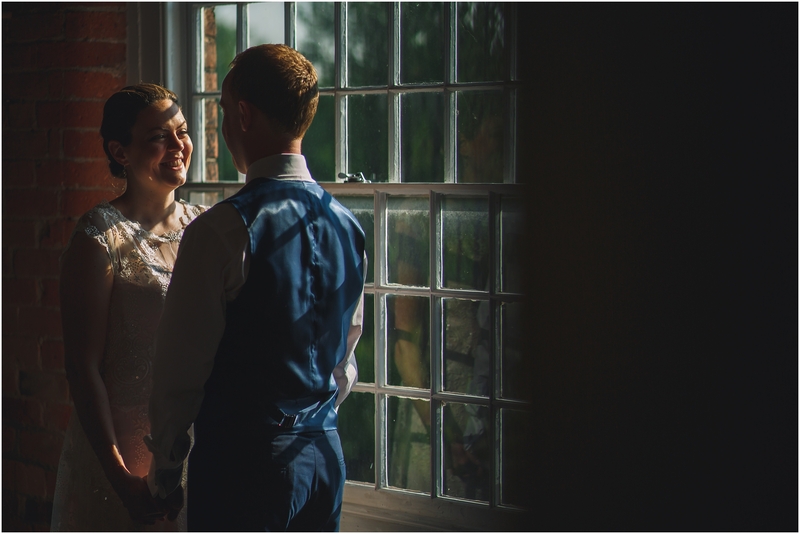 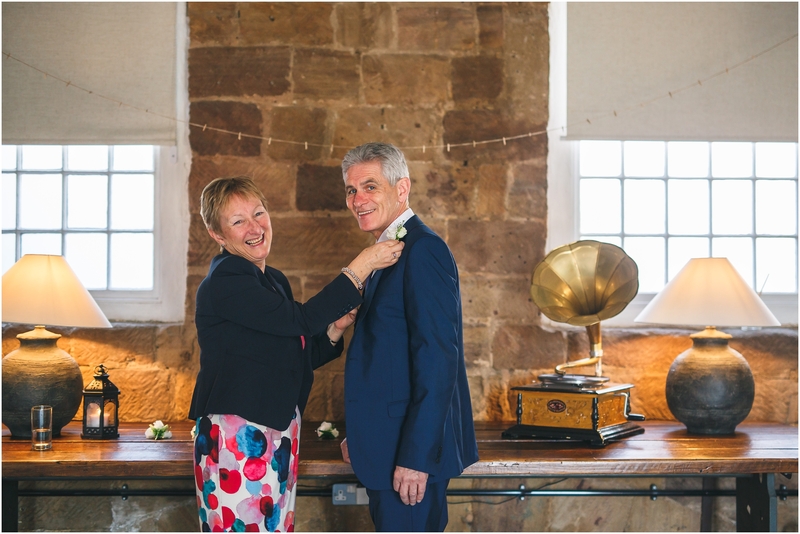 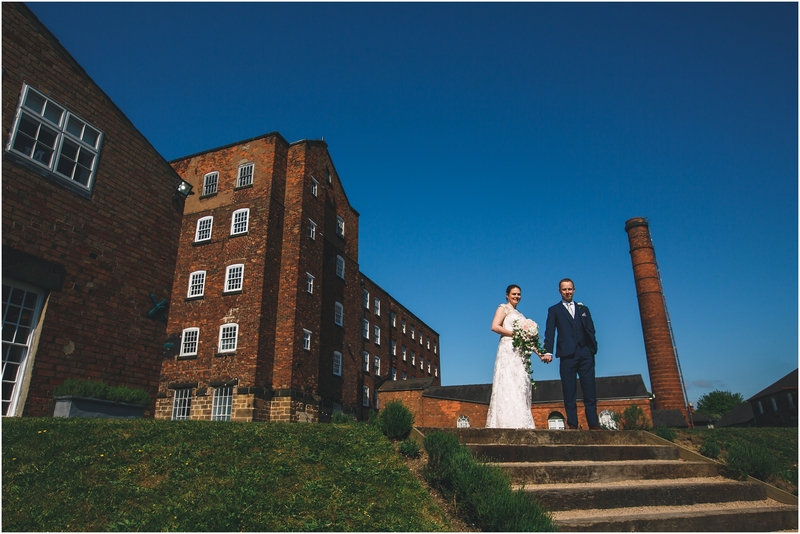 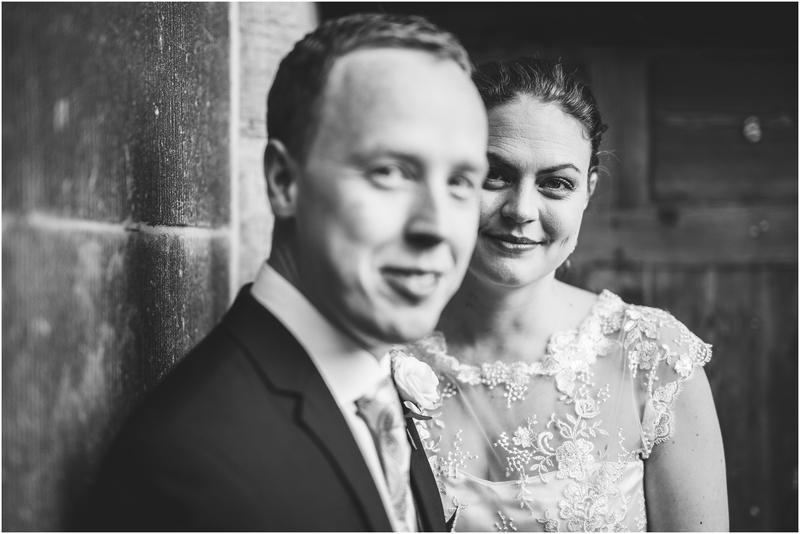 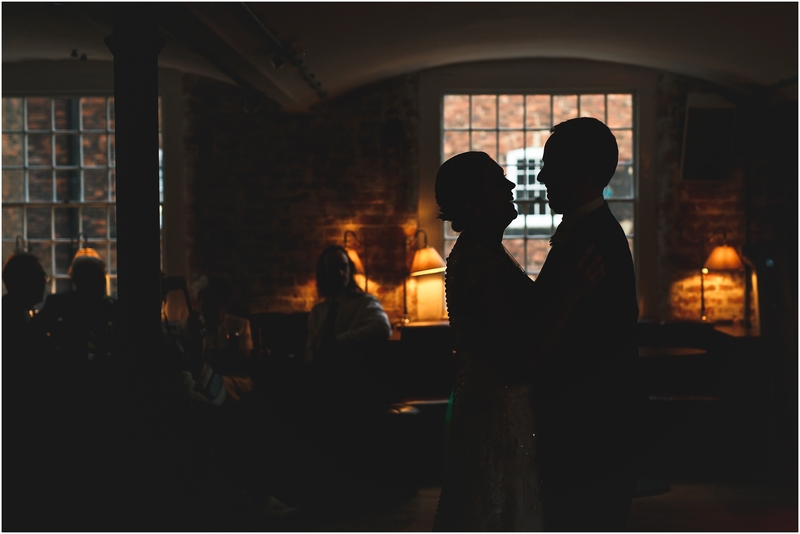 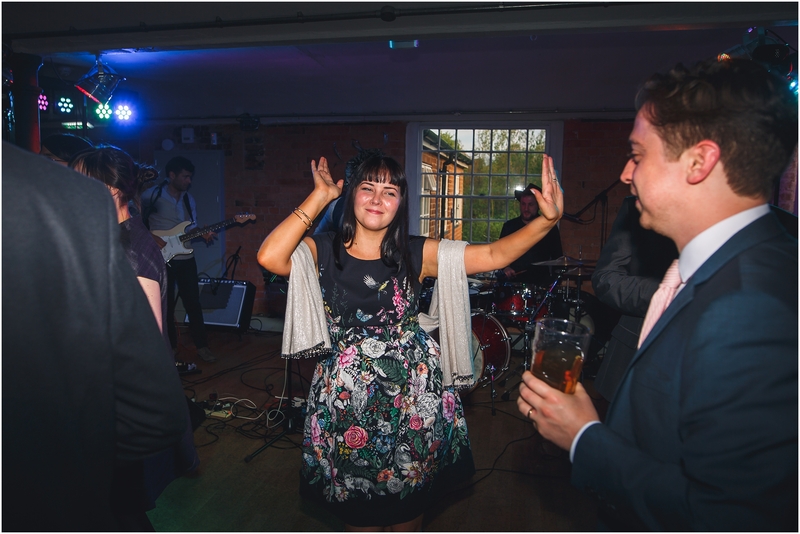 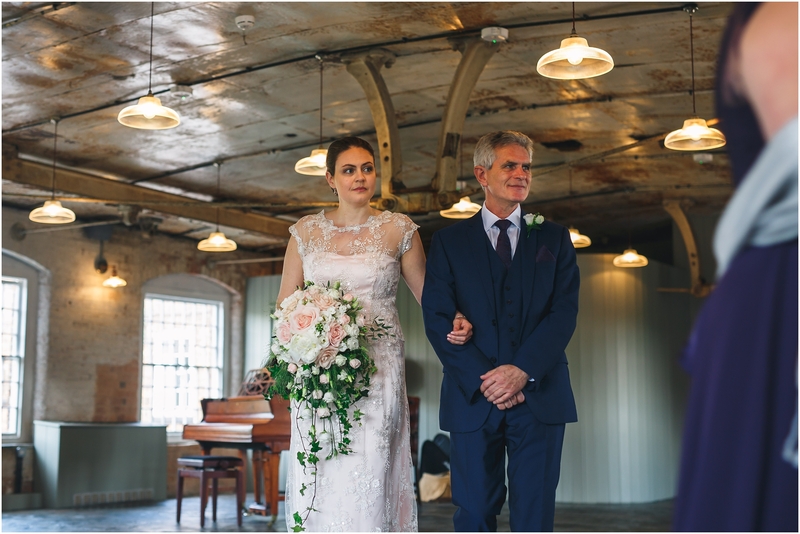 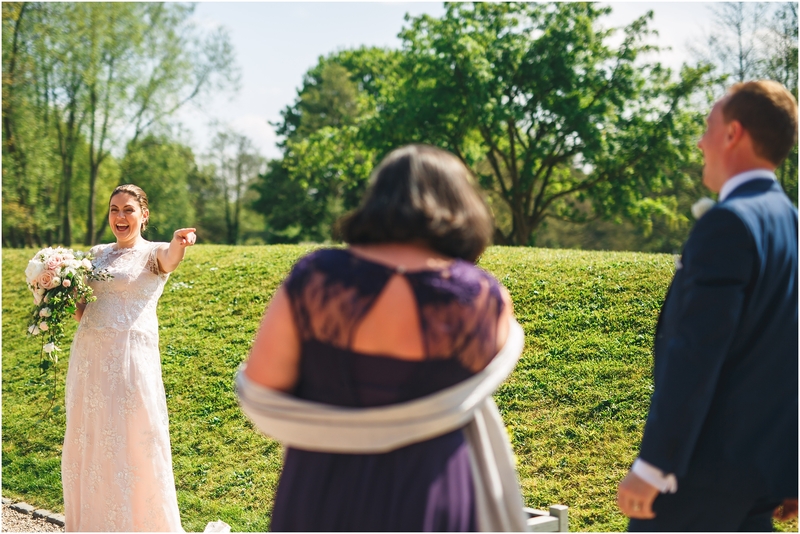 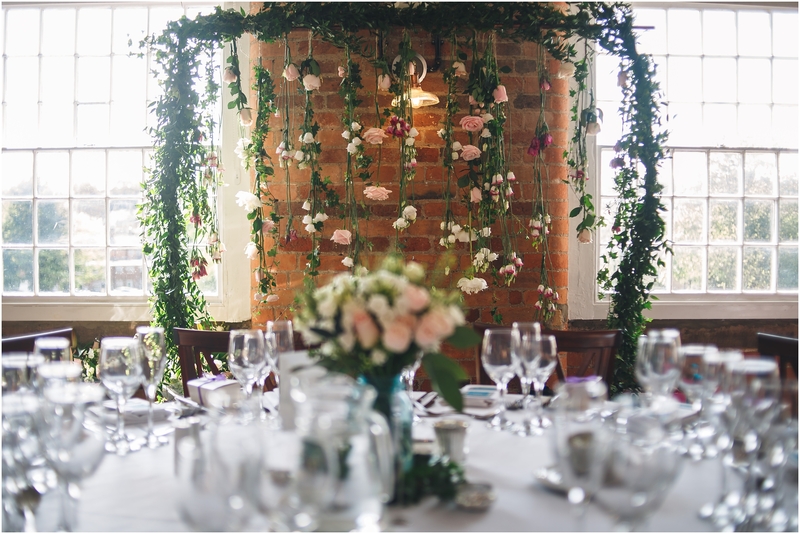 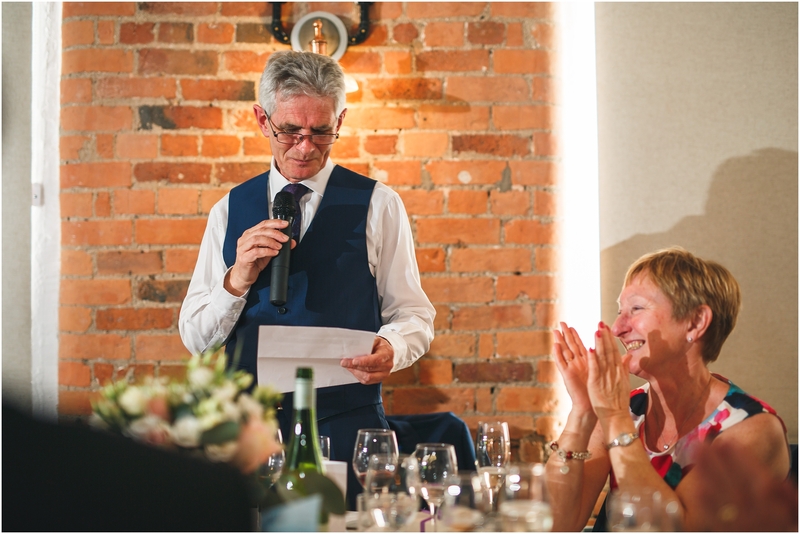 I love shooting at The West Mill as it provides so many different backdrops – the imposing mill chimney, the regimental windows, the river Derwent, the gardens, the courtyard and the open brickwork inside are truly a photographer’s dream! 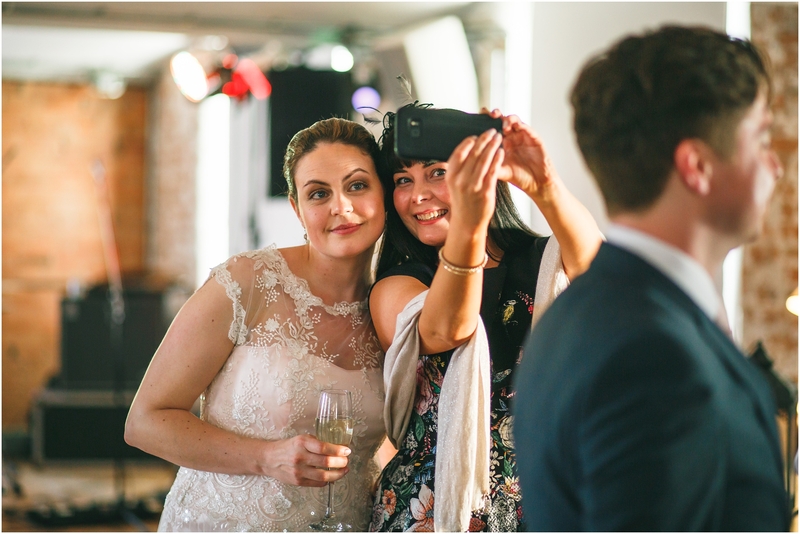 Luckily Claire & Adam were happy to be stolen away from their guests for a few minutes to capture some great couple shots. 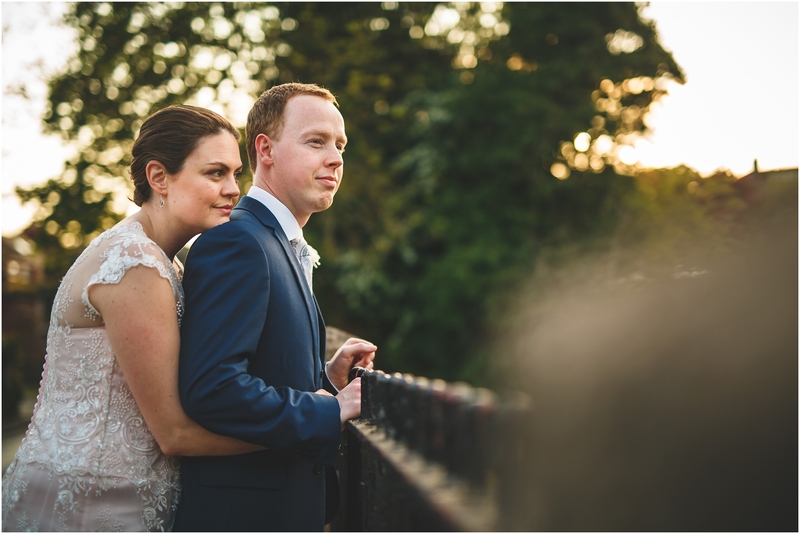 I always prefer to do mini portrait sessions at different times of the day, it means the newlyweds don’t feel like they’re missing out on their own wedding (because who would want to do that?!) 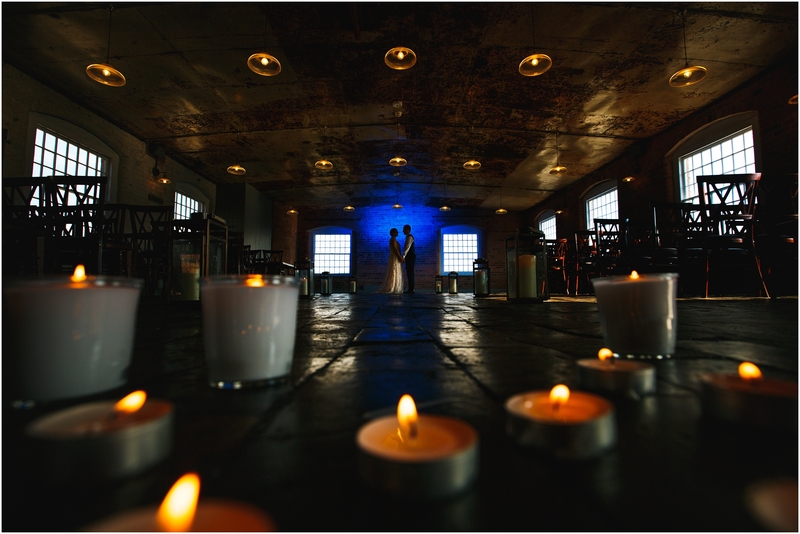 but it also gives them a few times during the day just to take stock of how epic it truly is! 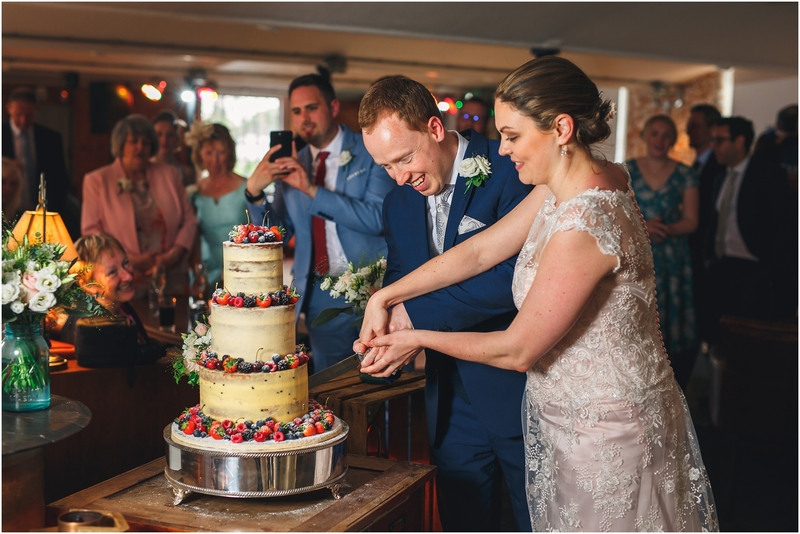 Following the speeches the simply decorated but elegant three-tiered cake by The Organic Wedding Cake Company was cut and then it was time to paaaaaaaaaarty! 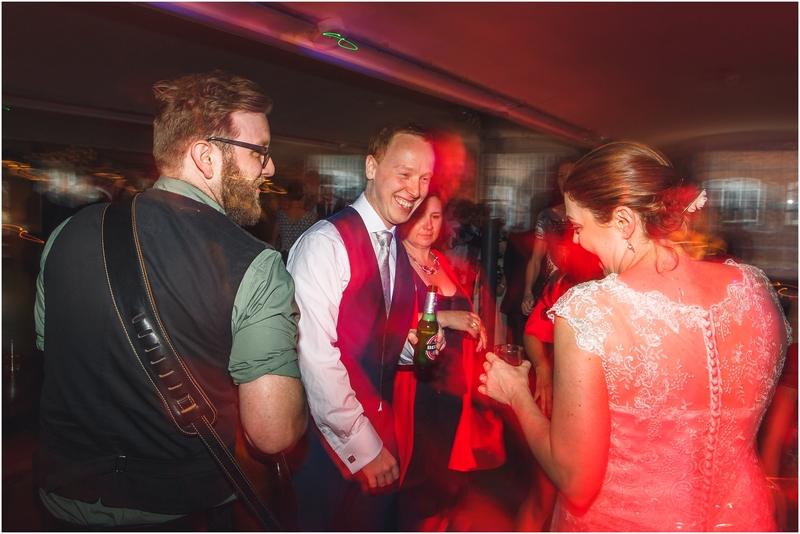 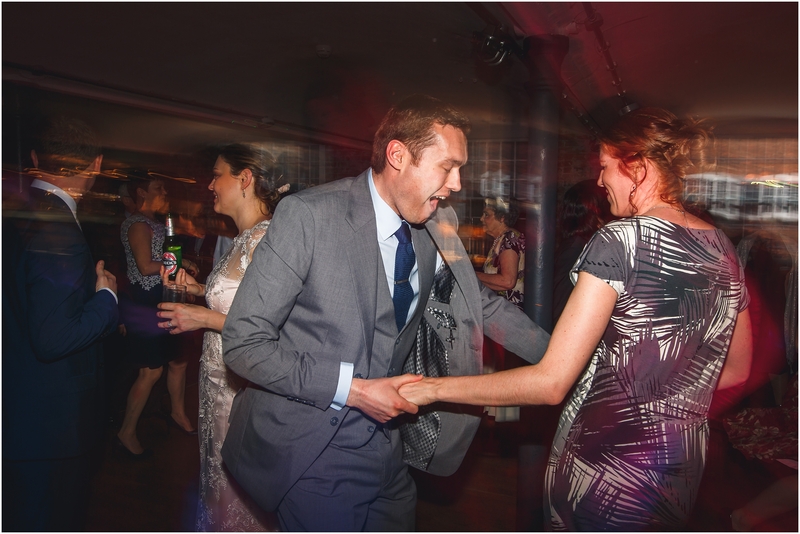 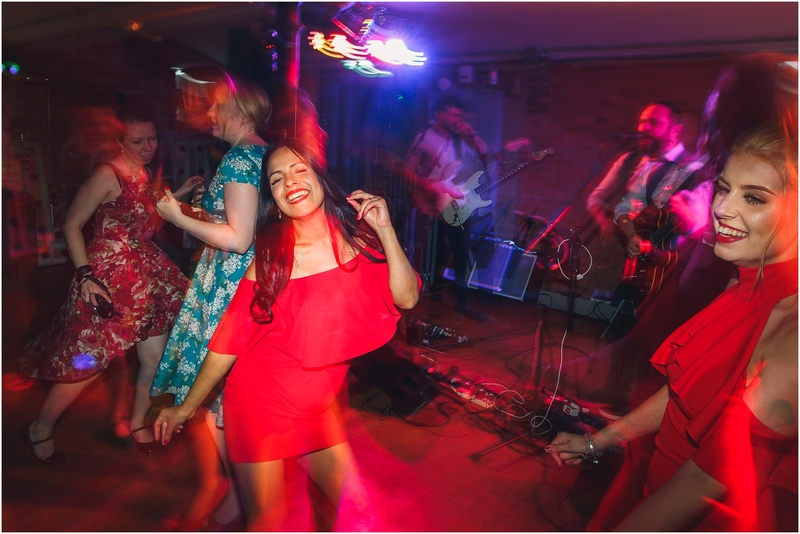 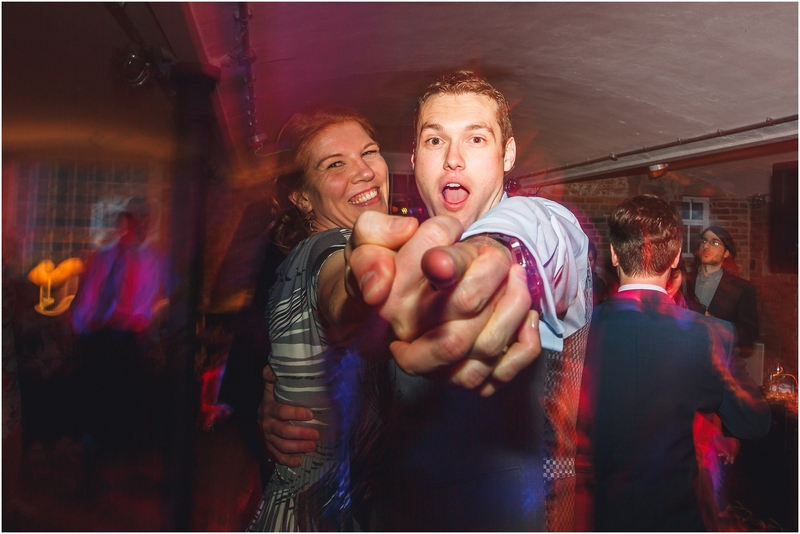 The Spinning Room was most definitely jumping as the live band took the stage and led the party on into the night. 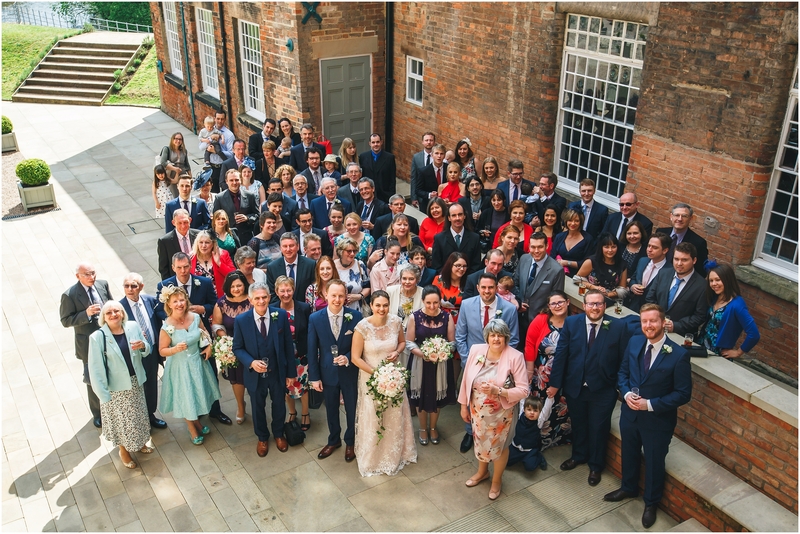 I had a truly fantastic time at Claire and Adam’s wedding, their guests were fab and #TeamWestMill as ever put on a fantastic day! 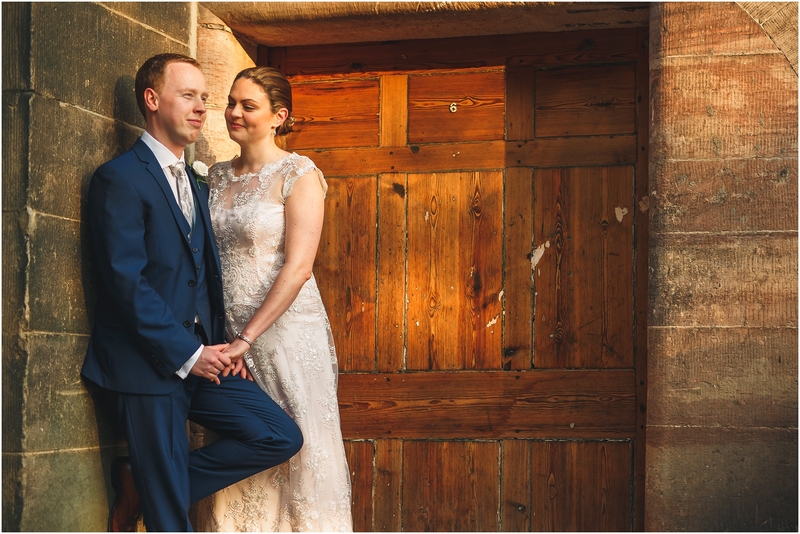 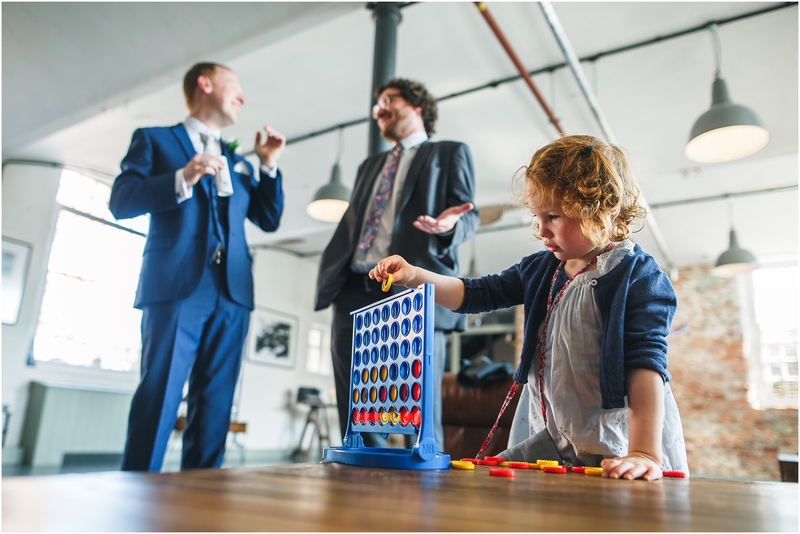 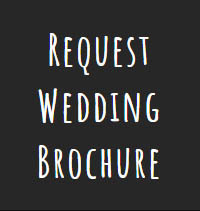 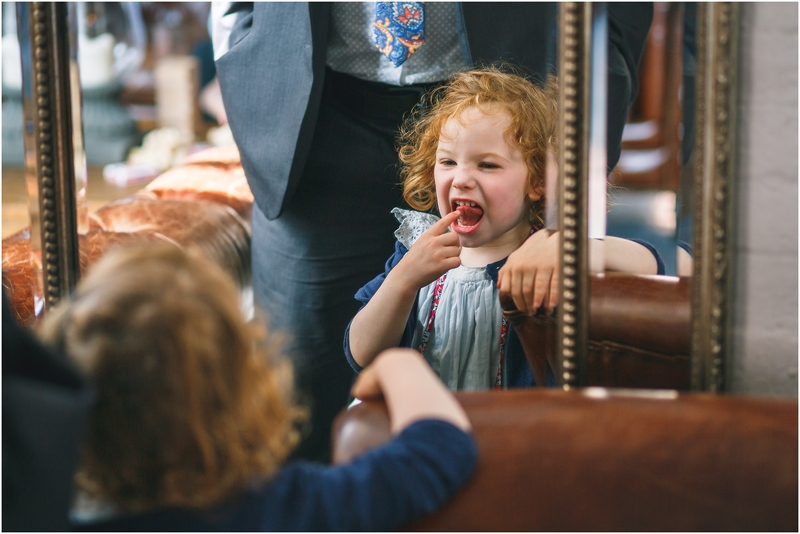 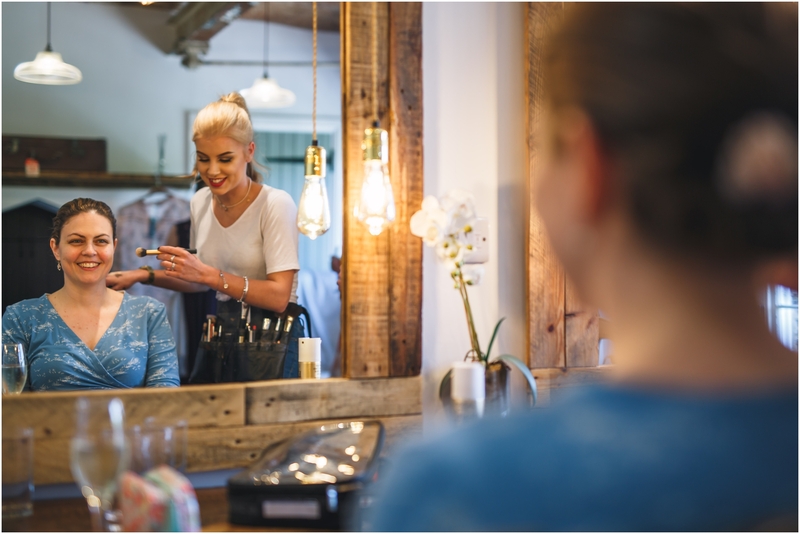 If you are interested in booking me for The West Mill Wedding Photography then please don’t hesitate to get in touch here. 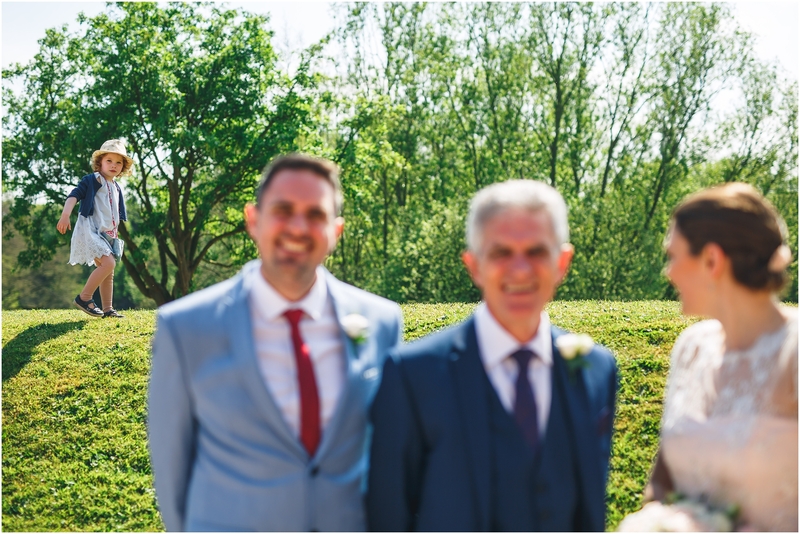 Cracking set of pics Gareth!